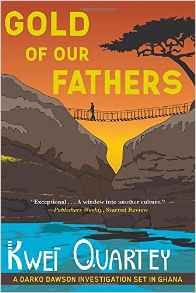 I have been a fan of this series, set in Ghana, since the first book, Wife of the Gods. Dr. Kwei Quartey writes with warmth and compassion and ruthless honesty about the struggles of his hero, Inspector Darko Dawson, a good man in a difficult and often corrupt system. In the interview, Kwei seems taken aback by my comparison to Raymond Chandler, but I stand by it: the mean streets may be in Ghana rather than Los Angeles, but the themes of justice and entrenched corruption are universal. Kwei has also written a novella outside of the series: Death at the Voyager Hotel, which features a woman amateur sleuth who is not content to let a hotel drowning be swept aside as a tragic accident. As always, if you’d prefer to read the interview rather than listen, here is the transcript. Enjoy! Laura Brennan: My guest today manages to juggle two careers, as both a crime writer and a practicing physician. Doctor Kwei Quartey writes the Inspector Darko Dawson mystery series, set in Ghana. The fourth book in the series, Gold of Our Fathers, takes Inspector Dawson into the world of illegal gold mining and the corruption that grows along with the promise of wealth. Kwei, thank you for joining me. Kwei Quartey: Thank you for inviting me, Laura. LB: Wife of the Gods is your first novel, and it’s just a tour de force. LB: Let’s start by assuming that someone is listening who doesn’t know anything about your series. What’s the basic thing they need to know going in? KQ: The series that I call the Chief Inspector Darko Dawson series, all set in Ghana, at least so far. And the protagonist Darko Dawson is an inspector in the Criminal Investigations Department in Accra. That’s the headquarters, but he is sent to other parts of the country, which is in fact what happens with Ghana police service officers, they get sent to various parts of the country. Darko himself is a good father and husband, he’s got two children and a wife who sometimes gives him insight into the mysteries he’s solving. He’s a bit of a rebel in the office, though. A little belligerent to his superiors and sometimes breaking the rules if he feels that the rules are silly or they need to be broken if he’s going to solve his mystery. LB: Now, you have also mentioned that — because you are a doctor — that being a doctor is a little like being a detective. KQ: The parallels are remarkable, actually. I once saw a couple in my practice and the woman, the wife in the couple, came in with a litany of complaints which were all disconnected, from headaches to a pain in her side, to joint pain. All sorts of disparate complaints. The husband, who came in but was quiet, I noticed was studying her very hard, and some of these things were tip-offs to me that there was a lot more going on beneath the surface. It only took one question for me to ask, one question for me in which I asked how were things going on at home, and that had the wife burst out crying. And then it turned out that the husband had been unfaithful and they were trying to get things back together again. But it was proving so stressful that the wife was showing all these different types of symptoms. And the lesson behind this story is that sometimes there’s much more beneath the surface or much more under your nose than — that you might not realize. And that applies to both the detective and the doctor. It’s up to both the doctor and the detective to look for clues all the time, to steer you in the right direction. Say I had followed strictly on this person’s symptoms. Okay, she had severe headaches, so I would be, say, going after an MRI or a CAT scan. Oh, pain in her side, okay, well then, I guess I’d better get a chest X-ray. Join pain, another X-ray. And then what would happen is, I’d end up probably getting a whole bunch of non-clues as to what was wrong, false clues as to what was wrong. I might have been led all the way down the garden path. And so with a detective, you’ve got to throw out the red herrings and get to the bottom of it by following the stuff that is real. And so it’s the same with the doctor. And when you find out eventually what illness was causing the patient’s complaints in the first place, that’s basically your murderer. And, you know, the satisfaction you get at the end is really, I would say it’s identical. LB: Wife of the Gods is a spectacular novel. It’s amazing actually to think it’s your first novel. Can you tell me a little bit about how that came about? KQ: It was a long time in the making. I first conceived of it in the year 2000, actually, and it came out in 2009. Funnily enough, I was watching a program in Paris, a documentary in which a rural detective in Côte d’Ivoire, which is one country over from Ghana, was solving a murder mystery by threatening his witnesses and suspects with the possibility of witchcraft. And I thought that was such an interesting concept, and I came up with a rough Darko Dawson who was fashioned essentially on that model. But over the years, he became a little bit more refined, because I found what happened was that the role I had pegged him into was a little bit limiting, at least I found it so at the time. I don’t know if I went back and sort of tried to rewrite it that way again, I would have that feeling, but at the time, that’s what I came up with. So that was part of it. But another part is, I suspect, although I don’t like to use the phrase alter ego because, well, because it’s used too much, I think it might be a bit of a psychological study in some ways. And that is that I was born in Ghana, I was raised there by an American, a Black American mother and a Ghanian father. And although I lived there until my teens, in some ways I feel as though I didn’t get the full Ghanian experience because I lived on the university campus, my two parents being university lecturers. And in that way, I felt as though I was a little isolated from, for example, my classmates, who I didn’t really hang out with in the urban environment. And I feel as though I could have gotten a much richer experience. So in some ways, I’m maybe wrestling a little bit with the part of me, the Ghanian-ness that I felt I missed out on. And maybe Darko is in some sense that person, that part of me that is Ghanian, that I think is a little bit underdeveloped. That’s a sort of pop-psych analysis, but I sometimes wonder if that’s partly what’s going on, kind of trying to sort out battles within me. LB: Well, you have him, in that first book, he’s facing his own demons. LB: But he faces them successfully. I love how you developed him over the course of the four novels. You also did a lot of research into actual police work. KQ: I still maintain very close contact with a good friend of mine who is actually in the homicide division at CID in Ghana. I made original contact with a very highly-placed official in the Criminal Investigation Department, which was a good thing at the outset, to begin with. But then I met a gentleman who in fact is a Lance Corporal in the Criminal Investigation Department, who has more of an inside view of what’s going on, which is quite different from somebody who is place very highly in the hierarchy. So from the very first day I met him, we’ve maintained contact all the way through, and sometimes it’s something really small that I need to know for my story. So, yes, I’ve even gone out — for my second book, I went out with him into the wilds of Accra during, you know, after midnight, when Accra becomes a very, very different place from the bustling city that it is during the day. It becomes very dark and quiet — in many ways a murderer’s dream, in some ways, because there are so many places you can get killed there. Not that it happens a lot! But in the writer’s mind, in the mind of a mystery writer, this is one city that you can get murdered in all sorts of ways in. In fact, that’s what happens in my second book, Children of the Street. Now, the first book that you referenced, Wife of the Gods, is really in the hinterlands, where a practice in which young women and girls are sent to a fetish priest as their indentured servant to kind of atone for something that might have been committed generations ago by a family member, which they fear now will bring on evil or misfortune. These fetish priests are intermediaries between the spirit world and the physical world and that’s why their servants, their female servants are called “wife of the gods.” What happens is that a young medical student who was railing against this system is found murdered in this town which is called Ketanu. Darko is sent there to solve the mystery, but the twist here is that it’s actually the city that he visited as a child, and from where his mother disappeared. That was the mystery that plagued him all through his childhood and his growing up. And so now he’s confronted with it again, and in fact he has almost two mysteries to solve. That’s the basic premise of Wife of the Gods. LB: In all of your books, he continues to confront fear of the police, mistrust, limited resources. Is that really typical of what’s going on in Ghana? KQ: Yeah. Take lack of resources first. As a contrast, think of some of the movies that you might have seen, especially police procedurals. Like, say a detective goes out to the countryside. Very often, they’re given a car, they might be placed in a reasonable home, it’s a part of the story that usually in Western movies and TV shows, you don’t really worry about the kinds of physical impositions of getting to a place, settling down in a place, moving around the area, transportation… Those are basic and fundamental issues in Ghana. The Ghana police service is not particularly family-friendly when it comes to moving. You might not be given a place, you might actually have to stay in a hotel somewhere for a while. Transportation-wise, it will come as a big surprise to some people that, in the investigation of a homicide, for example, many Ghana police actually rely on the transportation — say there’s a family member of the victim who was murdered, and that family member has a vehicle. They will actually provide the transportation to the detective to the scene of the crime. Because the detective probably doesn’t have a vehicle from the department, especially if it’s a small department. If he can go in the vehicle of the family member instead of paying for a taxi cab, that’s what he or she is going to use. So those are issues that come up in the everyday workings of police in the homicide service in the Ghana police. LB: Inspector Dawson has also encountered fear and mistrust. KQ: What’s happening is that the police are not seen as protectors in that sense. They, unfortunately, they come up as having a different reputation. And some of that has to do with corruption. You know, if anybody is to blame, it’s the Ghana police service themselves. If you are constantly asking the citizenry for money, whether there is an issue of crime or not, then you develop this reputation. Now, the causes of it are undeniable in that the police are not paid enough and making a living for them is difficult. So some of them find other ways to make money, and some of that includes corruption and bribery. For example, if you need to get out of a ticket or you want, say, you need the favor of getting a driver’s license or something — all of those can be achieved by offering money to the police service. And Darko hates this, and in fact in one of the novels, in my most recent one, Gold of Our Fathers, somebody tries to bribe him. Which almost makes him ballistic. Because his feeling about it is, it’s insulting to him for somebody to offer him a small amount of money to dismiss a case. Because the message there of course is, well, your mind is so fickle, I can give you a little bit of money and you’ll just forget about something that’s supposed to be your job. And Darko doesn’t like that at all. And he doesn’t like it even from the low level, from a low level policeman like a corporal or even a constable, all the way up to, say, the Inspector General of the Police, which is the highest police post that you can have in Ghana. So if there’s any corruption going on, and it doesn’t matter up to what level, Darko is going to try to find out about it, even at the risk of his losing his job or losing his life, because, you know, there may be somebody who really does not like that and who will put a price on his head. LB: Your books remind me, they feel like the Raymond Chandler Los Angeles. LB: Yes. What you have is, you have that one good man, and he is fighting institutionalized corruption. But you, actually, in your books, you don’t just have the one good man. I mean, Inspector Dawson is that person, but he finds other good people. KQ: He invokes the assistance of people who are good and he has an instinct about people who are good. Now, sometimes it’s wrong. LB: Your novels convey both a genuine warmth towards Ghana. At the same time, there’s a frustration with the problems — I mean, you tackle street children and oil exploitation and illegal mining. KQ: Basically, what’s happening in the stories is, there’s a large issue, and then it’s focusing in, kind of like a camera lens that you start with a large aperture and then you turn the dial and it focuses down to a teenie little hole, and that’s where the personal stuff comes in. Where the murder centers around some kind of personal issue, but then it opens up to the wider one. So in Wife of the Gods, it was a system of indentured servitude, and then belief in witchcraft as against, say, Western medicine. And then in Children of the Street, it was this issue of homeless children in Accra, who come from the hinterlands looking for work and then living on the street. It’s kind of like shattered dreams in the way. And then in Murder at Cape Three Points, which is book number three, it’s oil discovered off the coast of Ghana and the conflicts that result from the oil people against the fishermen, for example, the local fisherman who claim that the oil rigs are taking away their fish. And the oil rig figures say, well, you guys are destroying our installations by dragging your nets along the sea bed. So you’ve got that conflict there. And then in Gold of Our Fathers, we’re talking about exploitation of gold and the evils that come with it. As well as the destruction of the environment and people’s livelihoods. In my next novel, which will come out in 2017, it’s called By The Grace of God, there, we’re looking at religion in Ghana. Because Ghana has been voted, if not more than once, at least once in 2012, as the most religious country in the world. And we’re talking evangelism and Pentecostalism. So that’s where I’m going to take the issue of religion and then focus down to a murder that takes place against that backdrop. So, yeah, that’s the way I like to do it: come in from a larger picture, and move out from a small picture, and move outwards radially. LB: Are you making a lot of enemies in Ghana? KQ: (Laughter) But you know what, though? It’s that the books are not polemics at all. There’s nothing preachy about them. And even if things are identified as being an issue within the system, you’re always going to find the good half, the opposite half in the system as well. So, you know, you might have, say, a corrupt official in, say, a department. But then you’ve also got a really good guy who is there, or a good woman who is there, railing against that system as well. And then, say in Wife of the Gods, you have these really odious priests, fetish priests. But then you’ve got somebody who is, say, an advisor to the priest, or is close to the priest, who is willing to divulge something to Darko. Or who is willing to move away from that system. So what happens is, you can’t really say that Quartey is doing an outright condemnation of something, because he’s got good guys in there as well, and good women in there as well. In Gold of Our Fathers, there is a female police officer who is ranked very highly, and that is more unusual in Ghana, there are fewer highly placed female officers. And Darko, he’s just in awe of her, because she is so, she is so loyal not only to her profession, but she’s loyal to honesty as well. She’s probably going to be a recurring character because I liked her as well. So, you know, she sort of stands against, she’s a model of honesty and lack of corruption against this backdrop. So there you go, you’re always going to have somebody on the other side of the bad side. So it’s going to be hard to pin me down, I think. I hope, anyway. LB: Well, Gold of Our Fathers spoke to me because my husband is from coal country, where they did the same thing. They strip mined, and they were supposed to fill it back in, but instead they would vanish in the middle of the night. KQ: Yes, that’s exactly the same thing. In my, in Ghana’s case, what happened is something like, maybe tens of thousands, between ten and twenty thousand illegal gold miners came from China to Ghana to make their fortune in gold. And Ghana is the second-largest producer of gold after South Africa in the continent of Africa. It’s very rich in gold, and so what they do is, similar to your strip mining, is alluvial mining, which is mining gold that you get from deposits, either river deposits or river run off. And so what they do is they churn up the soil to get at the ore, which is several layers deep. And once they’ve done that, instead of backfilling, they just leave the area. So they leave this toxic soil on which very little can grow, except the hardiest of weeds, but which you cannot replant cocoa or palm trees. And so they leave these farmers destitute, without a means of income once they’re done with the gold area. And a lot of times they did for gold and find they’ve got an area of gold which is not that great. So then they just move on and don’t bother to backfill. Because of course backfilling those pits is expensive. LB: Right. And greed is greed the world over. KQ: Yup. You got it. KQ: You know what happened, Laura, is when I went out on that expedition with my police officer friend — he went with me because he said, “I need to show you certain areas and I also don’t want you to go alone. Because even though, in the end, you might be safe, I don’t want you to be a victim of robbery or something like that.” And people can spot me — I am Black, but I can tell you that, when I go to Ghana, I am American first and Black second, because they can spot me a mile away. Features that I have are recognizable to Ghanians instantly as being not 100% Ghanian. I’m half Ghanian and half American. So, when I went out on this expedition, there was one area of town where I happened to see this young kid, he might have been fifteen or so, and he was sleeping along a wall. And the wall, it was on the other side of the pavement we were walking along. And it was pitch black, I barely could see the person. But I saw him and I realized, you know, it’s so deserted right here, that he could get murdered and nobody would know it for maybe even a day or two. Now the other issue is that there’s this belief, which is probably partly urban legend, and that is that if you go and report a murder to the cops, you might be singled out as being a possible suspect yourself. Which of course does happen, but that is one of the things that is mistrust of the police that you alluded to earlier, that people feel bars them from immediately reporting a murder. So if they see something happen, they may look away and not say anything. And so that is the second factor that might make it conducive for a murderer to commit an awful crime and not be discovered. KQ: That’s right. I have to suffuse my mind of thinking like an American when I visit there. LB: There’s a great warmth towards the country, though, in your writing. KQ: You know, I grew up there until I was 18 or so. I think there’s a quote, I forget who made the quote, it was, “You can take a person out of Ghana, but you can’t take the Ghana out of them.” I think, people that you’ve met who have been to Ghana will always tell you just the wonderful experience that they had there. In spite of all, some of the real annoyances of day-to-day life, some of the slowness of the way things go, for example. But it’s very hard actually to forget the interactions that you have with people there, because a lot of times they can be funny, warm. Ghanians are very inviting to strangers, which I think is part of the problem of why Ghana keeps getting ripped off on all sorts of things, but that’s a whole other topic. But, yeah, it’s very hard to forget Ghana, and people I meet at my book signings, many people come up to me and say that they were in Ghana last year, five years ago, ten years ago, twenty years ago, and they just had such a terrific, human experience there, emphasis on human, you know? LB: That’s terrific. Did I miss anything? Is there anything you would particularly like to talk about? KQ: Well, I invite readers to give these novels a try. Even though it takes place in another country, what you’re going to find out is that, in the end, people have these remarkably similar needs and desires. You know, Darko wants his two little kids to succeed as much as any American parent wants their little kids to succeed. And what’s interesting is to see it against a different cultural backdrop. In the very end, you see that motivation is motivation is motivation. In particular, motivations to murder, when you get down to it, it’s all the same old things: love, lust, greed. And it doesn’t matter where you plant it culturally, it comes down to that humanity. So, you know, let’s take a look at that humanity in a different environs than what it’s usually used to. And have a little bit of an adventure. Solve a mystery and meet another culture from the comfort of your armchair. LB: Well, I have loved talking to you. I would keep talking to you all day, but I have to let you go. Thank you so much for joining me today. KQ: I appreciate it very much, Laura. It was great talking with you during this show.